I have never been able to figure out why some blog posts are so much harder to produce than others. Even after three years of blogging, I still haven’t found the magic formula that ensures each post will make it to publication smoothly. Let’s take today’s post for instance. It has felt like a monumental effort. 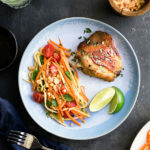 It is a delicious recipe for Asian marinated chicken with green mango and carrot salad. It’s a recipe I totally love and was so excited to share. The weather forecast last week called for sunny skies which usually makes photographing recipes a little easier. So, I was on schedule for getting this post out last week. Unfortunately, sometimes circumstances of life interfere with the best of plans. When you have two active kids and a couple of freelance jobs, things often don’t go as planned. I tried to rush through a cooking and photo session on Thursday while trying to finish some client work and running errands for my daughters. The resulting photos were dismal at best. A second attempt with more time on Friday yielded much better results though still not as good as I would have wanted. Although I seriously considered a third attempt at photos, I decided I needed to move on. Once I had the photos and recipe in place, it was just a matter of writing the actual post content. Easy, right? Wrong. So. Very. Wrong. We had one of the busiest weekends we’ve had in awhile which allowed me no time to write. So yesterday, I figured I could just focus on it and get it done. But clearly, the universe was conspiring against me. A technician came to our house to upgrade our internet speed and, instead, broke our service, declared he couldn’t fix it and left. And the company says they can’t send anyone else to look at the problem until tomorrow. I really wish I were making all this up but, sadly, I’m not. So, the nearby Starbucks is my temporary home office for today. However, you should not let the crazy circumstances of this post deter you from making these Asian-inspired chicken thighs. They are so flavorful and the green mango salad is wonderfully light and refreshing. Mangos are just starting to show up in the grocery stores here which is a perfect time to find an unripe mango. You’ll want to look for one that is really, really firm. It’s the tartness of the unripe mango that gives the salad its distinctive flavor and balances the boldness of the dressing. I had to use my mandoline to julienne cut the mango which I realize may not be feasible for everyone (or finding green mangos). I have read that you can substitute shredded cabbage for the green mango in this type of salad. The flavor would be slightly different but I think it would still be delicious. For those who have not cooked with fish sauce, I want to provide fair warning. There is quite a bit of fish sauce in this recipe which some people may find overpowering. However, fish sauce is delicious when used with the right ingredients and there is really no good substitute for it. In a blender, purée the cilantro, scallions, garlic, jalapeño, shallot, fish sauce and brown sugar until smooth. Put the chicken in a large resealable plastic bag and pour in the marinade. Seal and refrigerate for at least 2 hours or up to 6 hours. Bring to room temperature 30 minutes before cooking. Preheat the oven to 400 degrees and line a large rimmed baking sheet with aluminum foil. In a large skillet, melt 1 tablespoon of the butter in 1 tablespoon of the oil. Add half of the chicken, skin side down, and cook over moderately high heat until the skin is brown, about 3 minutes. Reduce the heat to moderate if the chicken starts to brown too quickly. Transfer the chicken to the prepared baking sheet skin side up and repeat with the remaining butter, oil and chicken. Roast the chicken in oven until it is golden brown and cooked through, about 25 minutes. Let rest for 5 minutes. While the chicken is roasting, make the salad. In a small bowl, whisk together the brown sugar, lime juice, fish sauce, and chili-garlic sauce until the sugar is dissolved. Set aside. In a large bowl, toss together the mango, carrot and tomatoes. Drizzle 3-4 tablespoons of the dressing over the salad and toss to coat. Taste and add additional dressing to taste. You may not use all the dressing. ed chicken thighs. Garnish with chopped cilantro, sliced scallions and peanuts; serve immediately. Recipe adapted from Food and Wine, April 2017.